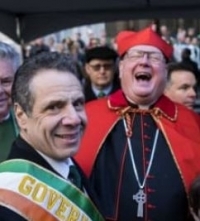 Andrew Cuomo, the ostensibly Catholic Governor of New York, has signed into law a “Reproductive Health Act” that allows for abortions up until the moment of birth, authorizes even non-doctors to butcher the unborn child in the womb, and strikes the crime of feticide from New York’s criminal law. In a hideously ironic twist, the same pretend Catholic had already vowed to end the death penalty for convicted killers in New York in “solidarity with Pope Francis.” The same Pope Francis, by the way, who has demanded worldwide abolition of the death penalty but never called for worldwide abolition of abortion. Giving our enemies “ammo” by affirming Catholic teaching on the natural law, which applies to all men! In other words, Dolan argues that the way to fight the enemies of the natural law is to allow Catholics to trample on it without suffering any consequences. 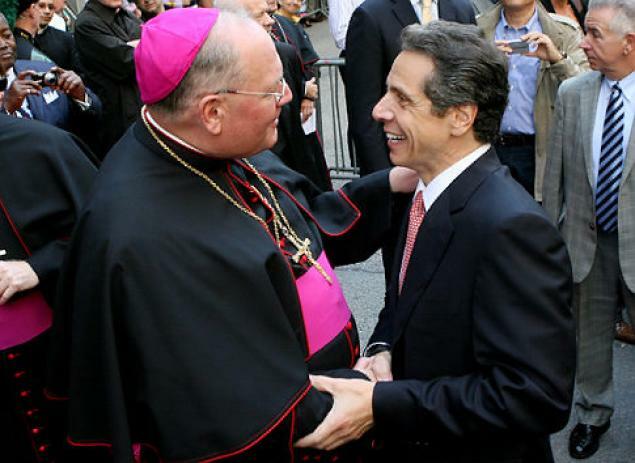 So according to Dolan, the correct approach to a “Catholic” politician who wages war on the Church’s teaching regarding the natural law is, in essence, to do nothing because Cuomo would not be moved — as if changing Cuomo’s mind were all that was involved here. Blah, blah blah. Dolan’s maundering vainly concealed a cowardly refusal to stand up to a so-called Catholic who publicly boasts of having legislated infanticide and who even had the World Trade Center lighted pink to celebrate his diabolical triumph. Not for Dolan is such honesty and courage in defending the truth against its brazen public enemies, who operate within the sheepfold it is his duty to protect from ravening wolves like Cuomo. Instead, Dolan laughs and shakes hands with the Devil, just as he does annually at his disgraceful Al Smith Dinner, where he sups and yuks it up with the adepts of Moloch who rule a nation that has turned its back on God and is in the final stages of self-destruction. With shepherds like Dolan, the Church is defenseless. Such is the crisis the Church must now endure.